BROMSGROVE RFC succumbed to back-to-back defeats in the league after losing 35-15 to rivals Old Halesonians. 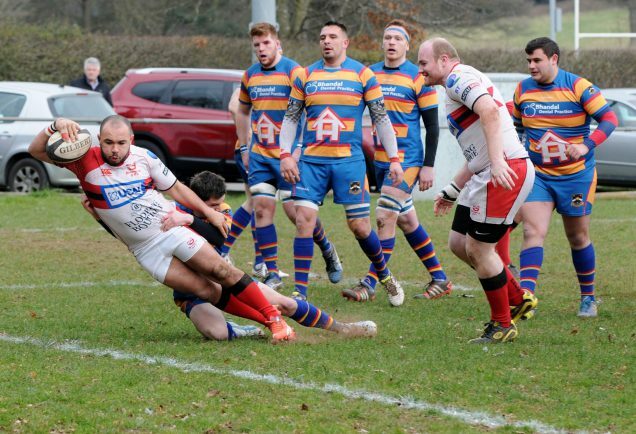 The result sees the Boars drop to sixth in the National League Three Midlands table after Peterborough Lions claimed a 60-28 victory over Sutton Coldfield to move up to fifth. Despite missing a string of regular first team players through injury and illness, it was the Boars who started the better as Liam Marshall got the first try of the game with James Upton putting away the conversion to make it 7-0 after four minutes. Bromsgrove increased their advantage to 12-0 as Mortlemans stretched the Old Hales defence before sprinting into the corner for the second try of the game; the difficult conversion was put wide. Old Hales forced their way back into the game and used their forward power to reduce the deficit to five points after Steve Leach crashed over for a try, followed by a conversion Oli Rayner. Bromsgrove battled away but almost conceded a try on the stroke of half time, but the defence stood firm to keep the scores at 12-7 to the Boars going into the interval. From the restart, an intelligent kick from Upton put the visitors under immediate pressure and the Boars pounded the opposition try line but the stubborn Old Hales defence stood firm. However, the Boars were awarded a penalty minutes later with Upton kicking to stretch the lead to 15-7. This spurned Old Hales on as Joe Oxford touched down after sprinting into the corner before Rayner kicked the conversion to make the score 15-14. Three minutes later Chris Hooper bundled over the next try with Rayner again converting to put Old Hales in front for the first time in the match at 21-15. Just after the hour mark, Old Hales got their fourth try of the game – and a bonus point – as Dave Hadkiss carved his way through the Boars defence to touch down, followed by Rayner’s fourth conversion of the game to make it 28-15. Old Hales were awarded a penalty try later in the game which Rayner converted once again to complete the scoring at 35-15. The Boars are in action on Saturday as they make the trip to second-from-bottom Old Northamptonians.